Nebula Collection by Bestar is the ideal solution for organizing small spaces with multiple purposes. With crisp, modern lines, create your dream layout by combining the different units to meet your needs according to the available space. The mechanism provides simplified assembly of the Wall Bed. Increased comfort due to Euroslat mattress support system. Simple and safe dual piston system makes opening and closing user-friendly. Easy to use; use the handle to pull the bed towards you to lower the bed and flip the leg down onto the floor. Accommodates a standard queen mattress up to 12 inch thick and weighing at least 70 lbs. The bed when opened will require a clearance of 92.3 inch from the wall extending into the room. Clearance of 9.6 inch under the bed when it is open. Mattress not included. Box spring not required. Easy to install. Assembly required. The kit includes a queen size wall bed, two 25 inch storage units, two reversible doors and two 3-drawer sets. The mechanism provides simplified assembly of the Wall Bed. Increased comfort due to Euroslat mattress support system. Simple and safe dual piston system makes opening and closing user-friendly. Easy to use; use the handle to pull the bed towards you to lower the bed and flip the leg down onto the floor. Accommodates a standard queen mattress up to 12 inch thick and weighing at least 70 lbs. The bed when opened will require a clearance of 92.3 inch from the wall extending into the room. Clearance of 9.6 inch under the bed when it is open. Mattress not included. Box spring not required. Each storage unit has 2 fixed and 3 adjustable shelves to maximize your options. 4 clothing rods are included in this kit. Easy to install. Assembly required. 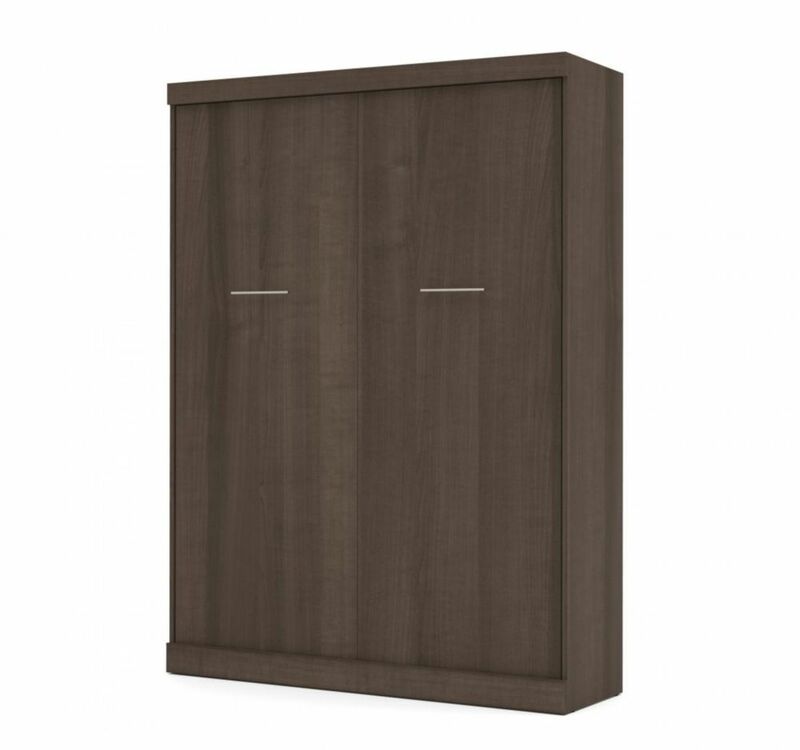 The kit includes a full size wall bed, a 25 inch storage unit with one reversible door and a 3-drawer set. The mechanism provides simplified assembly of the Wall Bed. Increased comfort due to Euroslat mattress support system. Simple and safe dual piston system makes opening and closing user-friendly. Easy to use; use the handle to pull the bed towards you to lower the bed and flip the leg down onto the floor. Accommodates a standard full mattress up to 10 inch thick and weighing at least 70 lbs. The bed when opened will require a clearance of 87.3 inch from the wall extending into the room. Clearance of 9.6 inch under the bed when it is open. Mattress not included. Box spring not required. The 25 inch storage unit has 2 fixed and 3 adjustable shelves to maximize your options. 2 clothing rods are also included. Easy to install. Assembly required. Nebula Collection by Bestar is the ideal solution for organizing small spaces with multiple purposes. With crisp, modern lines, create your dream layout by combining the different units to meet your needs according to the available space. The mechanism provides simplified assembly of the Wall Bed. Increased comfort due to Euroslat mattress support system. Simple and safe dual piston system makes opening and closing user-friendly. Easy to use; use the handle to pull the bed towards you to lower the bed and flip the leg down onto the floor. Accommodates a standard full mattress up to 10 inch thick and weighing at least 70 lbs. The bed when opened will require a clearance of 87.3 inch from the wall extending into the room. Clearance of 9.6 inch under the bed when it is open. Mattress not included. Box spring not required. Easy to install. Assembly required. Nebula Queen Wall bed - Antigua Nebula Collection by Bestar is the ideal solution for organizing small spaces with multiple purposes. With crisp, modern lines, create your dream layout by combining the different units to meet your needs according to the available space. The mechanism provides simplified assembly of the Wall Bed. Increased comfort due to Euroslat mattress support system. Simple and safe dual piston system makes opening and closing user-friendly. Easy to use; use the handle to pull the bed towards you to lower the bed and flip the leg down onto the floor. Accommodates a standard queen mattress up to 12 inch thick and weighing at least 70 lbs. The bed when opened will require a clearance of 92.3 inch from the wall extending into the room. Clearance of 9.6 inch under the bed when it is open. Mattress not included. Box spring not required. Easy to install. Assembly required.